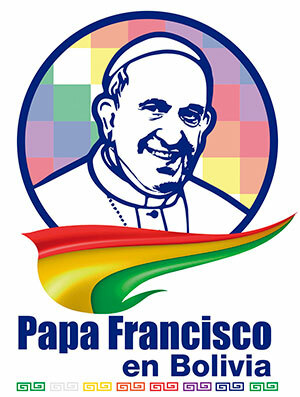 All are invited to my presentation with Catholic University tomorrow, Thursday, August 16 at 10am in La Paz, Bolivia. I will be presenting the data from the past three years of studies looking at market trends, production yields, costs, net-earnings, and the social-economic standing of quinoa growers from 2015 – 2018; after the quinoa boom where market prices soared and quinoa producers became Bolivia’s new rich, for a day. Now things have quieted down though quinoa is still a strong economic asset for the country with 32,000 tonnes exported in 2017 valued at $74 million. Quinoa made it to the “top 10” list of regional economic products for the Department of Oruro too – a place more known for its mineral production than agriculture. 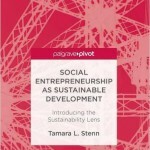 So the study – rooted in sustainability, looks at the economic, cultural, environmental and social aspects of women’s lived now – after the boom; after Peru has overtaken the world quinoa market and has driven down prices with higher yield production methods and different, faster growing, quinoa varieties; after the global market analysts and data collectors have left Bolivia; after the regional agricultural development programs have ended; after the houses have been rebuilt and closed up. We examine the future for Bolivia’s quinoa farmers which lies rooted in a just price, 25% higher than today’s market price. A price that will value the unique properties of the Bolivian Royal Quinoa – which cannot be produced anywhere else in the world. The large, creamy seed which is packed full of complex proteins, vitamins and minerals, omega3s and others. The distinct varieties which add amazing texture and deep flavor notes to everyday cooking – and are unknown outside of the rural kitchen. The deep cultural traditions, legends, hand labor, and love that go into the slow production of the world’s finest quinoa. The women leaders of the multi-million dollar export cooperatives will be present at this presentation as will women leaders who are working to transform the countryside into one of regional, indigenous, autonomous governance – where the people themselves decide their development, future and traditions. I hope you can make it to the presentation. If not, no worries, the data, stories analysis and insights will be published in a series of academic papers over the next year. A book will be written and there are plans for a movie to be made as well. This is not the end of the quinoa journey – just the beginning. Thank you for coming this far with me. My contact info is: tamarastenn@landmark.edu. WhatsApp 1-802-579-3386. Please keep in touch. Day 34: What’s next – wrapping it all up – new projects. I’m now in La Paz – at a lovely AirBnB with wifi and river views located just a few blocks from Catholic University. I am far from the quinoa fields. La Paz is called NYC in a tea cup in reference to its wide deep valley filled with tall apartment buildings and modern offices – crisscrossed by the ever-moving silent teleferricos – suspended cable cars that take Boliviana across un and down form the vast city to the endless communities extending outwards. With the 3-year quinoa study ending, the question is what’s next? I am now faculty at Landmark College, teaching Economics and Entrepreneurship in the Business and Professional Studies Department. It’s nice to have a long term contract and steady work. The Landmark students are different from my 5-college whizzes and SIT graduate students who have worked on different parts of the quinoa project from the US – in the form of open ended, applied learning in my marketing and entrepreneurship classes. My Landmark College students learn differently and are nuerodiverse – they need more structure and support in their classes. So I need to have carefully developed case studies and predictable, calm environments for them to work in. What emerged is the Quinoa Real gourmet variety project and a two week study away program to be housed in Salinas. I spent the last week in Salinas and Oruro, setting up the groundwork for these projects. The organic, Fair Trade FLO certified cooperative APQUISA will provide US-ready 1-pound packages of cleaned varieties of Toledo Amarillo for “quinoa pilaf” and Panela regular and toasted for the most amazing quinoa soups and stews. This is the way the Andean women cook – using varieties, not just colors in their cooking. Both these varieties are white and are traditionally sold mixed together in the common market. My students will be exploring their individual properties, qualities, differences and introducing them the to US consumer in a project of “direct buy” – bypassing the expensive and cumbersome container-scale supply chain they are now hooked into. This will be a diversification project to complement the larger sales the farmers currently work with – one aimed at bringing a minimum 800Bs per quintal value to the quinoa and more directly benefitting the producers themselves – creating an undisputed market niche for Bolivia’s Royal Quinoa varieties. I will also have my students working with Caslila – the rare, clear quinoa of the Bolivian mountains. When cooked this quinoa is gummy and is used in breads, pastries and desserts. I am thinking King Arthur Flour in Vermont will love it! Catholic University in Cochabamba will be helping with laboratory analysis of the quinoa varieties so it will really be a shared effort. There is a national market for quinoa varieties too that I am encouraging producer organizations to take advantage of – from the 4-star restaurants of the large cities to the quickly expanding national network of supermarket – the “Hipermaxi.” Introducing quinoa varieties will also help to preserve seed diversity explained Catholic University’s Jean Paul, a sociologist studying potato markets. Besides the market study I am proposing to have the students come to Salinas for an annual study away program about Global Markets. Here they can learn together about the culture, production and transformation of quinoa – right from the quinoa capital itself! The group will then split into three smaller teams and spend a few days coming up with innovative ways of working on either the cultural aspects with the 5,000 year old ruins, artifacts and mummies of Aycalla a primitive quinoa town, production points of quinoa growing in the rural community of Otuyo or transformation technologies related to the quinoa machinery in the Salinas town. These insights will be shared with a larger community audience. In between there will be opportunities to explore the quinoa kitchens, colonial and geographical history of Salinas with 500 year old Spanish mills, naturally carbonated mineral springs and the Tunupa volcano (dormant). In between all this, students will have time to stroll quiet town streets, wonder at the vastness of the surreal salt flats, and reflect upon it all under the wide altiplano skies. Traditional welcoming ceremonies and departure blessings will be shared too. The quinoa story does not end – it just keeps growing! On August 16th I will present my quinoa data at Catholic University in la Paz and have guests – women leaders from the quinoa fields – come and present their experiences and answer questions. I will also have a small quinoa market at the university gates and will be serving quinoa snacks at the presentation. I hope to have 60 people attend – including students, quinoa workers and the press. Day 16 – Getting around in Bolivia: a photo log. You never know what to expect when traveling around in Bolivia! I had to re-schedule my week of city visits in La Paz when the Pope came to town. The El Alto transportation hub was essentially closed for days as people prepared the parade route. And offices were closed too. So I had to cancel many visits until Thursday, after the Pope had left. 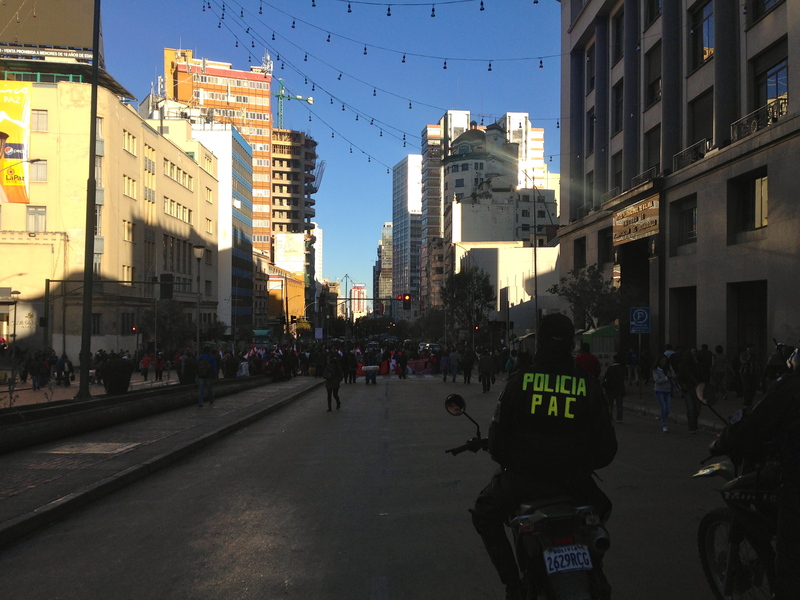 Road block during rush hour on The Prado ,La Paz´s busy downtown main street. Then the only challenge was the road blocks. Road blocks are a common way Bolivians bring more attention to issues they think might have missed the governments attention, such as in this case, development work that was left undone in the city of Potosi. Though not all is a huge challenge. 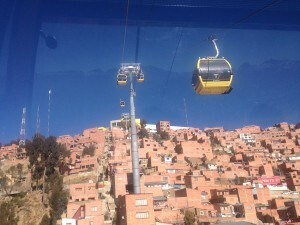 The new Teleferrico cable car system makes transportation from the high altiplano region of El Alto to the center of La Paz 1,500 feet below a joy. 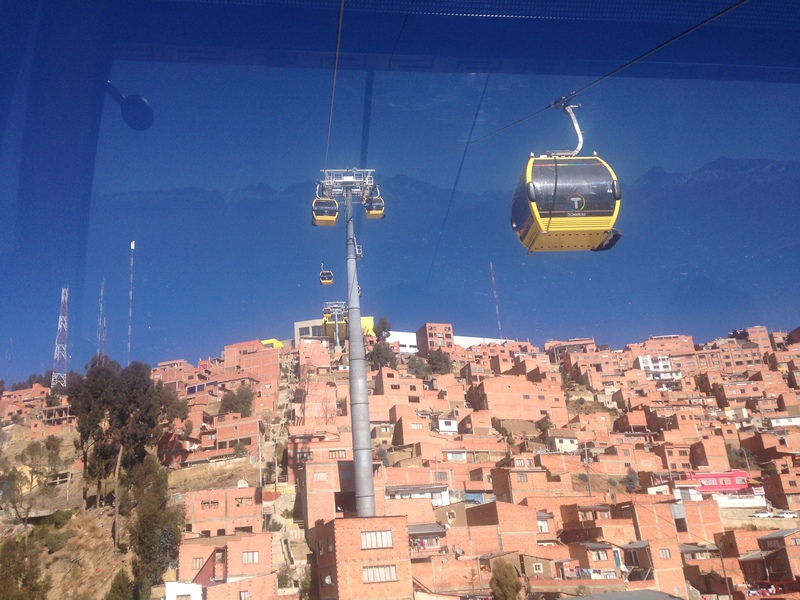 I felt I was the Pope myself ascending down from the heavens to meet the people of La Paz, as I rode in my Yellow Line cable car for the first time. And at just $.45 (3 Bs) each way, you can’t beat the price.